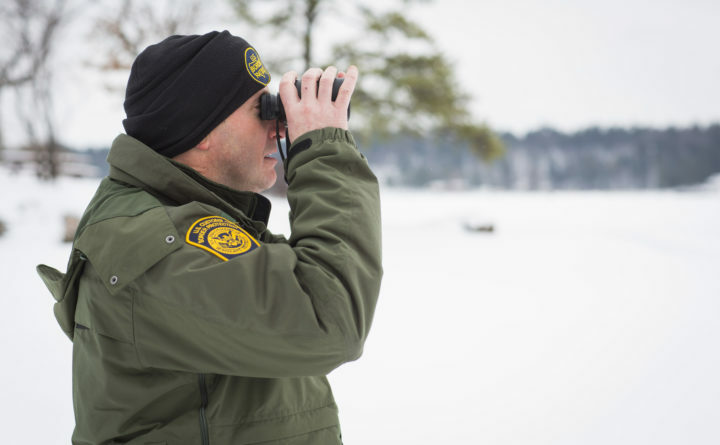 A U.S. border patrol agent surveys the Canadian border in this photo provided by the U.S. Customs and Border Protection office. SWANTON, Vermont — The U.S. Border Patrol says agents arrested 20 people who entered the country illegally in four separate incidents in upstate New York, Vermont and New Hampshire. The first case came early Friday when agents in Champlain, New York, arrested nine Haitian citizens who had just crossed into the United States near where I-87 reaches the Canadian border. On Saturday, agents apprehended seven Romanians and a German citizen who had just entered the country illegally in Newport, Vermont. On Sunday, a Guatemalan citizen was apprehended near Franklin, Vermont, and two other Guatemalans were apprehended near Pittsburg, New Hampshire. Border Patrol officials could not immediately say when was the last time so many individuals had been caught in four separate incidents a span of three days.